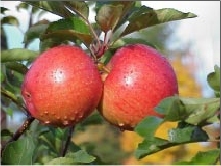 The Apple/Tree Fruit IPM program provides newsletters, pest forecasts, field visits, diagnostics and troubleshooting, educational presentations, applied research, and other management support to help tree fruit growers optimize yield while also meeting economic, environmental, social and personal objectives. The University of Maine Cooperative Extension Apple Integrated Pest Management (IPM) Program helps apple growers make optimum pest management decisions by providing state-of-the-art information on pest biology, monitoring, and management options. In addition to background information for planning and interpretation, the IPM Program provides updates on the current and upcoming apple pest situation during the growing season. The program gathers information from all available sources, (including grower experience, scientific journals, and communication with research/Extension colleagues in the northeast) and disseminates it through annual and weekly publications, educational presentations, and individual consultations. With improved decision-making resources, growers are better able to reach their safety, economic, environmental, and social goals. The goal of the program is to facilitate a systematic and strategic approach to apple pest problems. The strategy is built by selection and use of tactics in a complementary manner. Decisions about an individual pest are coordinated with other objectives, including profitability, environmental stewardship, management of the same pest at a later time, and management of other pests. Presentations at the Agricultural Trade Show, other meetings, college classes, and civic groups, etc.